The idea of going to Pizza Hut as a childless adult seems kind of strange – it conjures up images of children’s birthday parties with the unlimited ice cream machine, fairly mediocre quality bloat-inducing pizza, and personally, alternate Friday nights with my brother and sister when we’d have a ‘handover’ meal with our parents then head to Dad’s for the weekend. I remember the last time I went as an older teenager, having more of an understanding of the value of money, I was vaguely offended at the cost of a meal for a family of four there, where all of the ‘children’ were a bit too old to order from the kids menu. So in light of the above, Pizza Hut was going to be an unlikely candidate for a feature on this blog. Even disregarding all of that, a couple of years ago I don’t think many of us would have imagined that this chain would be innovating in the plant-based food space. But as it turns out, last year Pizza Hut were among a few which added a vegan cheese option to their pizzas, and for Veganuary 2019 they’ve taken a step further by launching the new ‘jack ‘n’ ch**se’, which after huge success in its first couple of weeks, they’ve announced already that it’ll be added to their permanent menu. They put together this super helpful blog post on what else on the menu is vegan too. I booked us a table for two on a Tuesday evening as they had an offer on 41% off food while dining in (I still don’t understand the significance of 41, perhaps someone can enlighten me)? When we got to the restaurant at around 7.30pm, at first I was a little worried it was closed, as the restaurant was completely empty, including at the first glance of staff too. But the lights were on and the ‘open’ sign up so we went inside and were greeted straight away by a waiter who seated us. The set up has changed since I last went and you now take a look at the menu then go up and order at the counter. As we were the only ones in the restaurant this suited us fine, though I can imagine at busier times it might be a bit annoying if you have to queue. We helped ourselves to a bowl of ‘unlimited’ salad while we waited for our food, which didn’t take long to arrive (though as there was no one else to cook for I suppose you’d expect that). The salad was exactly as I remembered it, you couldn’t help but wonder how long it had been sitting out, any leaves were a little bit curled around the edges and some of the cucumber slices looked a bit slimy. 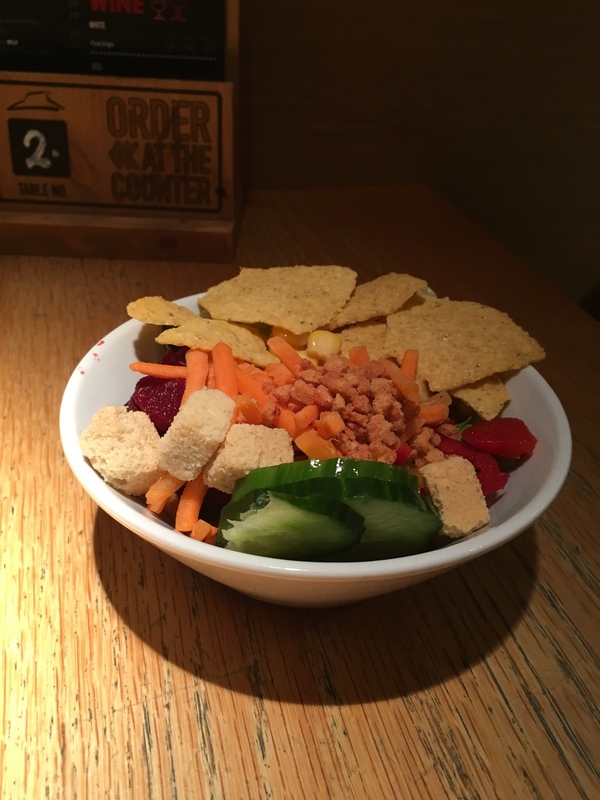 I managed to navigate the bits that looked slightly more appealing to fill myself up a bowl which admittedly was 50% salad, 50% ‘bacon’ bits, tortilla chips, crispy onions and croutons. You could definitely take or leave the salad bar but a couple of bowls does do a good job at filling you up enough to save a couple of slices of pizza to take home for the next day. The Vegan Margherita pizza arrived first. Although the cheese doesn’t look melty, and at first appears a bit sparse compared to a dairy counterpart, when we took a bite we found it was way cheesier than it looked. 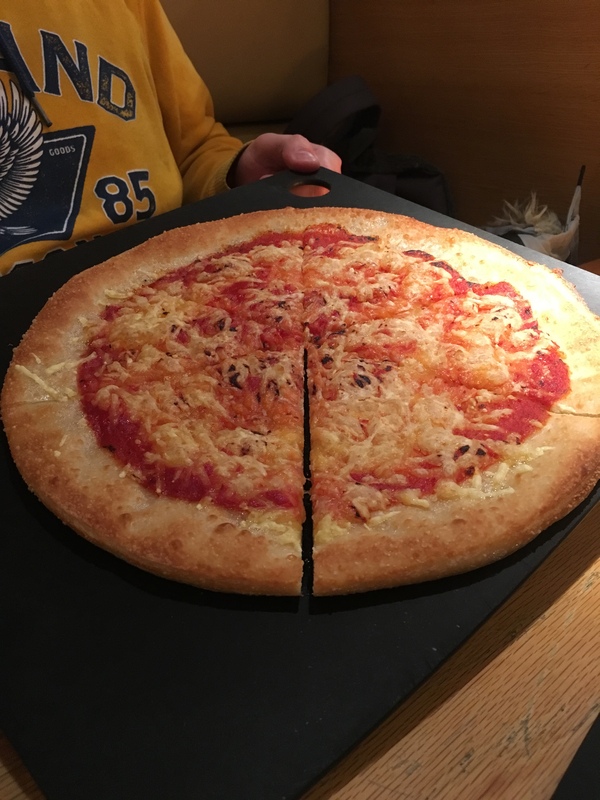 It’s made with Violife which does have that classic vegan cheese quality of sticking to the backs of your teeth, but all in all it was one of the better vegan pizzas I’ve experienced out, particularly considering it is just plain vegan cheese and tomato. That said, after trying the other two options on the vegan menu, we kind of thought “what’s the point”? It’s hardly any cheaper than the ones with toppings so not really the best value in comparison. 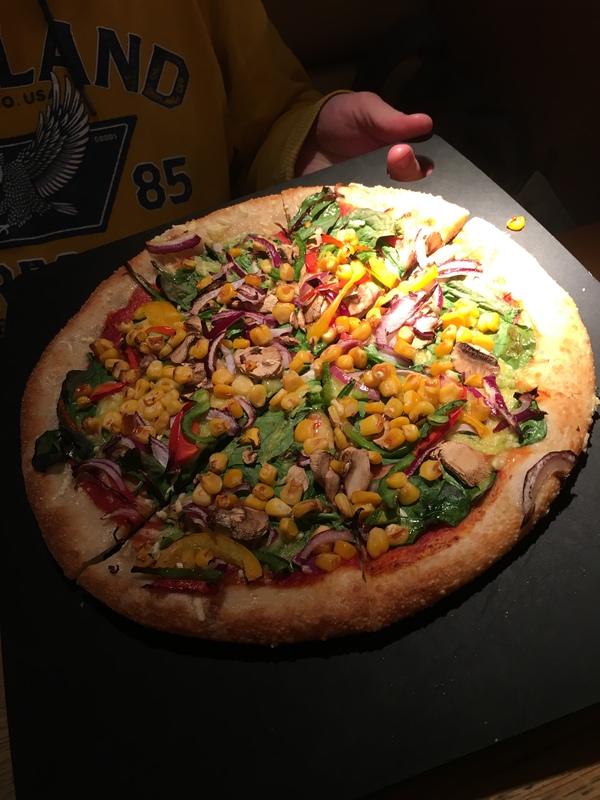 The second pizza we tried was the ‘Vegan Veggie’, which came looking exactly as it does on the website, absolutely loaded with toppings, which is something the other chain restaurants offering vegan pizzas can be pretty stingy on so we definitely appreciated that. Jamie’s not a big fan of veggies so he didn’t love the pizza, but still said it was a good substitute for the non-vegan version. In terms of what’s on the market currently, it was a pretty decent offering. We’d gone with the All American Thin base for all three, as we both knew the doughy deep pan pizzas would leave us really regretting it later. They’re obviously not the highest quality base but they weren’t too greasy and I prefer it to comparable fast food style pizzas such as Dominoes (which admittedly I obviously haven’t eaten for a while)! 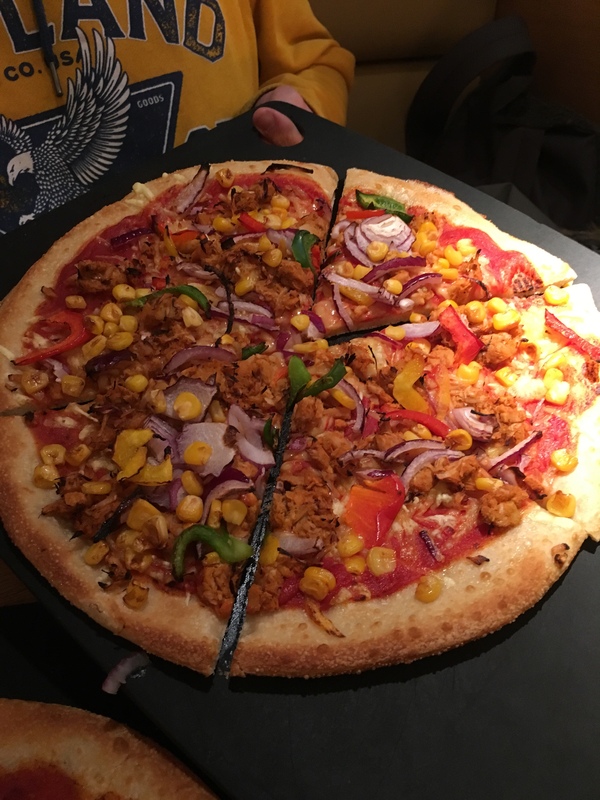 The ‘Jack and Ch**se’, which was Pizza Hut’s big launch for January, was the last one we tried and was definitely the best of the three. Sadly we think we were missing the BBQ drizzle (either that or it was so minimal that we could neither see nor taste it) but with help-yourself BBQ sauce on hand it needn’t be too much of an issue. The jackfruit was pulled chicken style, a little spicy, and leant a nice texture to the pizza along with some crunchy veg. Again the chef was generous with the toppings so you definitely weren’t being cheated of anything. It’s good to note that this was just as enjoyable cold the next day for lunch. It’s easily one of the best vegan pizzas that you can buy at a chain restaurant right now. We had ordered a side of onion rings and fries too (who even knew they did those?) out of curiosity more than anything else, to see how they’d compare with other fast food places. The chef had obviously forgotten to put them in the oven so they came a while later than our pizzas but as we had plenty of food to keep us going we didn’t mind. 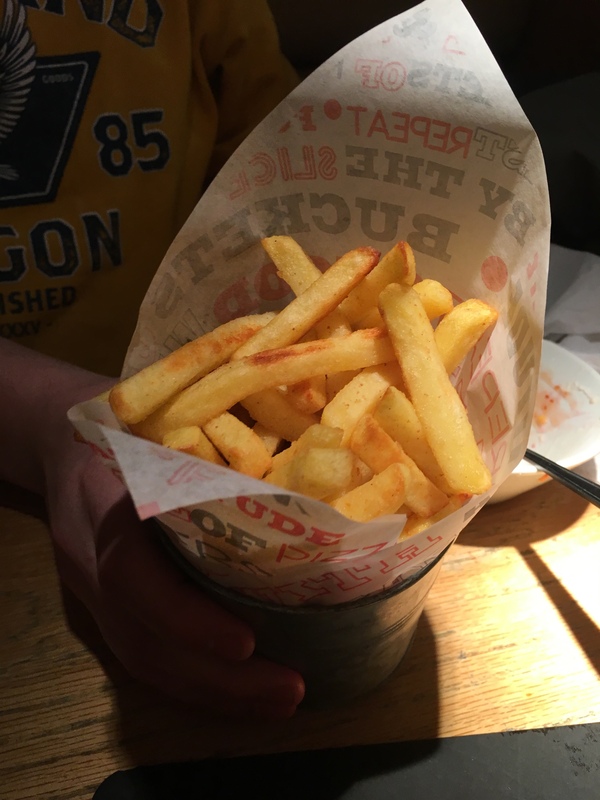 The fries looked like they’d be crisper than they were, and perhaps would’ve ideally been cooked for a bit longer. They were McCain oven fries style as distinguished by the texture, and were very low salt compared to other restaurant chips (enough so that I actually used the salt shaker which is a pretty rare occurance). The portion size was good, one was definitely enough between two of us. 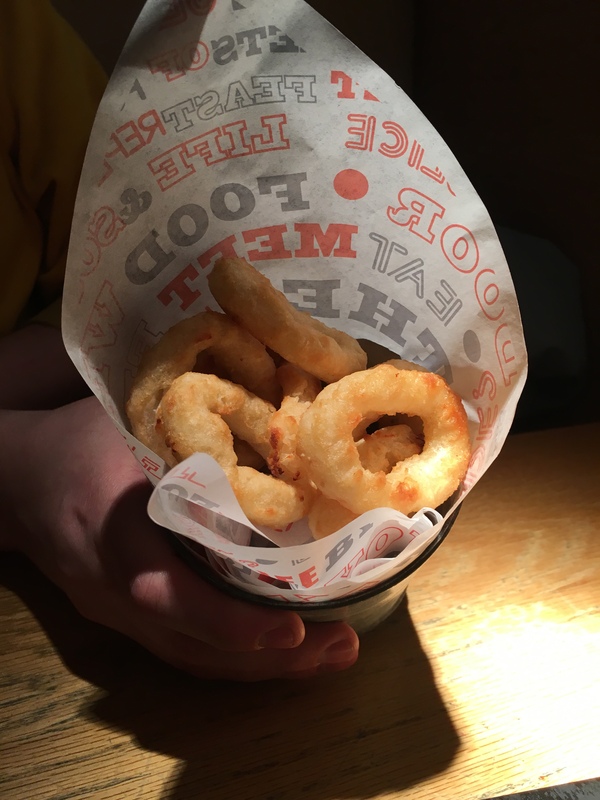 The onion rings were piping hot, crispy on the outside but soggy in the middle… which I believe is how they’re supposed to be? From the texture alone you wouldn’t be able to tell there was any onion there but it tasted exactly how you’d expect. All in all, we really had no complaints about our meal. If you liked Pizza Hut before going vegan, you’ll certainly like it now. And if you didn’t really like Pizza Hut before going vegan (I probably fall into this camp) you might find yourself pleasantly surprised. Despite my impressions about value for money from years ago, having looked at their website, there are so many offers available that you really needn’t pay full price, unless Friday nights or Saturdays are absolutely the only times you can go. There are various deals on takeaway or dining in, including a 20% student discount outside of those peak times. They’re definitely focusing on families with the decor and atmosphere, but I think anyone could enjoy a reasonable meal here. Our waiter was really friendly and helpful and compared to some of the chains I’ve visited recently, I think we could do a lot worse than Pizza Hut.